THE ONLY COMPLETE COLLECTION BY THE NOBEL PRIZE-WINNING AUTHOR In this definitive collection of Ernest Hemingway's short stories, readers will delight in the author's most beloved classics such as "The Snows of Kilimanjaro," "Hills Like White Elephants," and "A Clean, Well-Lighted Place," and will discover seven new tales published for the first time in this collection. For Hemingway fans The Complete Short Stories is an invaluable treasury. Paris and on excursion to Pamplona, immediately established him as one of the great prose stylists and preeminent writers of his time. In this book, Hemingway quotes Gertrude Stein, "You are all a lost generation," thereby labeling himself and other expatriate writers, including F. Scott Fitzgerald, T.S. Eliot, and Ford Madox Ford. 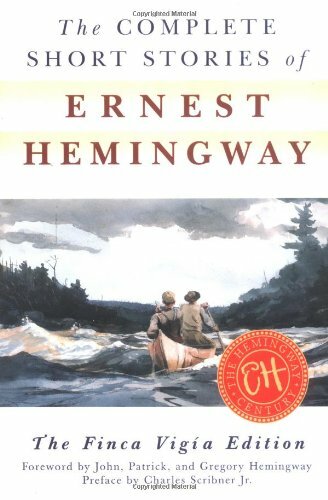 Other novels written by Hemingway include: A Farewell To Arms, the story, based in part on Hemingway's life, of an American ambulance driver on the Italian front and his passion for a beautiful English nurse; For Whom the Bell Tolls, the story of an American who fought, loved, and died with the guerrillas in the mountains of Spain; and To Have and Have Not, about an honest man forced into running contraband between Cuba and Key West. Non-fiction includes Green Hills of Africa, Hemingway's lyrical journal of a month on safari in East Africa; and A Moveable Feast, his recollections of Paris in the Roaring 20s. In 1954, Hemingway won the Nobel Prize in Literature for his novella, The Old Man and the Sea. A year after being hospitalized for uncontrolled high blood pressure, liver disease, diabetes, and depression, Hemingway committed suicide on July 2, 1961, in Ketchum, Idaho. Preface to "The First Forty-nine"
Short Stories Published in Books or Magazines Subsequent to "The First Forty-nine"